When we have to add beams to join notes, it can be confusing. Stems up? Stems down? Stems up and down? Which way does the beam slant (or angle)? How long are the stems supposed to be? Ugh! I'm getting a headache just trying to organize the concept of "adding beams" into one blog. After a Time Out and a Coffee, I've decided that this is definitely a Multi Blog Topic. 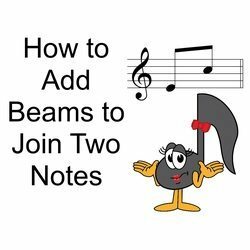 In this Blog, we will look at adding beams to join 2 notes only. I will look at adding beams to join 3 notes and to join multiple notes in other Blogs! Question: Are the following examples Correct or Incorrect? The answer is that they are all incorrect. The following are "General Rules" to add beams to join two notes. Please note that these are "GENERAL Rules" and, as always happens, there will be exceptions to the rules. Use these rules as guidelines when you add beams. Add Beams - Start with Knowing Stem Rules! In Example 1, the stem went up on the first note as it is below the middle line, and down on the second note as it is above the middle line. Yes - that is the stem rule and it is taught on Page 40 in the Prep 1 Rudiments Workbook and on Page 16 in the Basic Theory Workbook. However, when we add beams (or a beam) to join 2 stems, we need to use the "Beam Rules". This rule is found on Page 41 of the Prep 1 Rudiments Workbook and on Page 16 in the Basic Theory Workbook. Now this is easy - no matter how many notes there are, you look at the first note and the last note. Here are 4 examples of Contour. Can you tell from the answers (below each measure) how I defined the Contour for each measure? That's right! The direction of the pitch between the first note and the last note identifies the contour. The slant or tilt of the beam depends on the contour of the group of notes. Repeated notes have a horizontal contour; use a horizontal beam (straight across). Patterns beginning and ending with the same pitch (first note and last note) have a contour that is horizontal (neither ascending or descending); use a horizontal beam (straight across). When the first note is high and the last note is low, the contour is descending; use a descending (angled downward) slant or tilt on the beam. When the first note is low and the last note is high, the contour is ascending; use an ascending (angled upwards) slant or tilt on the beam. The shortest stem is always approximately one octave longer. The tilt or slant of the beam is always no greater than one staff space. Therefore, some stems will definitely be longer than one octave in order to maintain the correct tilt or slant of the beam. Add Beams - What Is Wrong Here? Let's have some fun! Before I show you the correct way to beam our 2-Note Examples, can you identify what is incorrect in each measure? Measure 1 Example: The stems must go up or down, not both! Measure 2 Example: The Beam Angle/Slant is too steep. Measure 3 Example: The stem for the first note (G) is too short; the contour is ascending so the beam should be ascending (which will change the length of the stem on the second note). Measure 4 Example: The note furthest from the middle line is D, so the stems should be going up. Also, the beam angle is too steep. Did you catch all those boo-boos? Before I show you what the Correct 2-Note Examples will look like, I want to remind you that if these concepts are new to you - that is OK! Like I've said before - "You don't know what you don't know until you realize that you don't know it"! If you love learning, I would truly recommend that you check out the UMT Complete Music Theory Course. On a personal note, I was one of those people who believed that I knew everything about theory. When I bought Glory St. Germain's first edition of the Ultimate Music Theory Workbooks, I realized just how much I didn't know (and I didn't know that I didn't know it! LOL!). 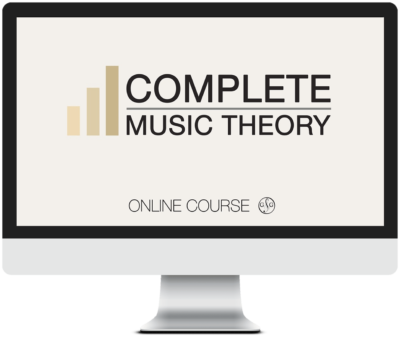 If you are a Teacher, taking the UMT Complete Music Theory Course online just might be the best gift you ever give yourself. You will fill in the gaps in your theory foundation and you will become so much more comfortable teaching these concepts to your students. If you are a Student, taking the UMT Complete Music Theory Course online will not only support your practical studies, it will make you a stronger, more confident musician. Check it out now! And finally - here is what the Correct 2-Note Examples looks like! PS - Do you know why there are 2 choices for the Measure 3 Example? Another missing piece of the puzzle…… thank you!